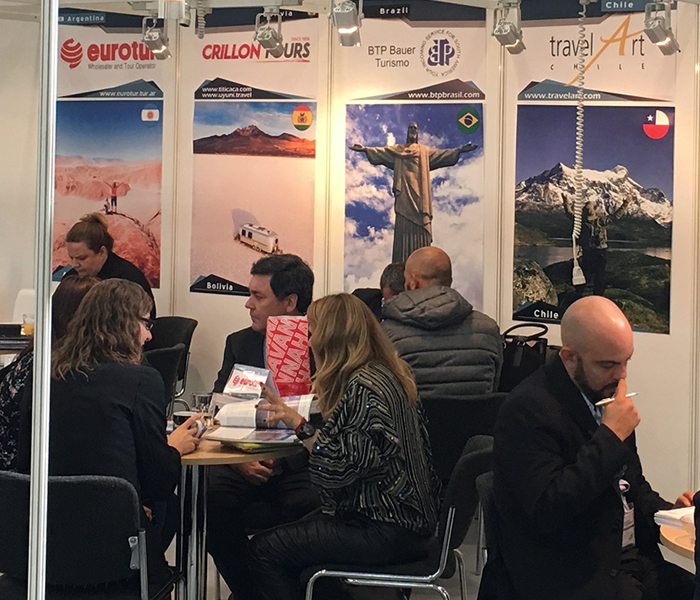 TravelArt was also present this year at the LAE Latin American Encounter stand at Europe’s most important travel fair, the ITB held in Berlin. Our long-time customers had the opportunity to meet CEO Enrique Sacchetti and Sales Manager Claudia Umscheid and also personally greet the new managing director of travelArt, Alex Lopetegui, who has been managing our office in Santiago since December. During the show, there were many discussions about the results of the past season, and we are very pleased that next year we will continue to work together to plan future trips and programs to Chile. As always, it was helpful to hear the wishes and ideas of our customers first hand. We gladly accept the useful tips for optimising our services and product ideas and will take them into account when planning and preparing trips. Fortunately, Chile is climbing higher and higher on the popularity scale of coveted travel destinations, and it is our heartfelt wish to make a positive contribution to this development with our passion and know-how. We look forward to another successful collaboration with our partners in the 2019-2020 season and will do our utmost to provide our guests with perfectly organised trips through Chile and unforgettable experiences. We sincerely thank you for your trust!